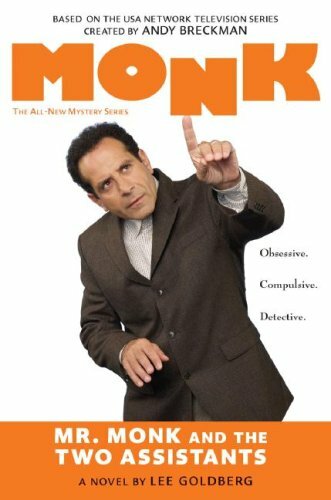 Fourth in the all-new series of original mysteries starring Adrian Monk, the brilliant investigator who always knows when something's out of place. Now that her ne'er-do-well husband has been arrested for murder, Monk's former assistant, Sharona, is ready to reclaim her place in Monk's extremely well-ordered life. But his current assistant, Natalie, is not pleased with this turn of events. While Monk tries to maintain a delicate balance between the two women, he discovers a few snags in the case against Sharona's husband. And with other murders to investigate, Monk realizes he may be up against a killer who not only understands him, but is one step ahead. About Lee Goldberg (Author) : Lee Goldberg is a published author. Published credits of Lee Goldberg include Mr. Monk and the Blue Flu (Thorndike Large Print Laugh Lines). 3/13/2009 Dawn Schenk said: Assistants are fun but, not when you have two fighting for you.Mr. Monk has just that and more when you read this book. You will see.